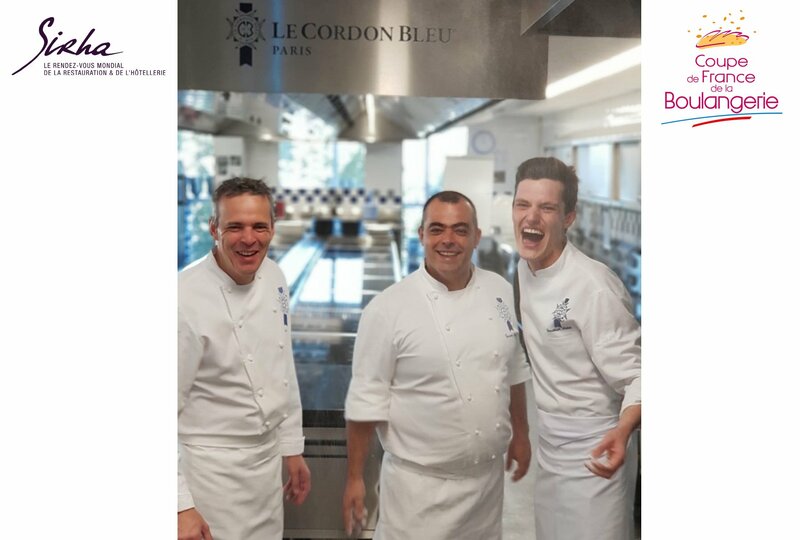 Paris, December 2018 - Le Cordon Bleu, the leading Global Network of Culinary Arts and Hospitality Management Institutes, is proud to present its team of three Chef Instructors who will take part in the 14th French Boulangerie Cup, coached by Chef Olivier Boudot. With weddings as its theme, the competition will take place in Lyon from 26 to 28 January 2019 during SIRHA, the premier global restaurant and hospitality event. Chefs Vincent Somoza, Gauthier Denis and Frédéric Hoël will aim to set themselves apart amongst the twelve participating teams. Bread category : in addition to recipes using French tradition flour, the chefs must demonstrate their expertise in regional, gluten-free and nutritional breads. Freshly baked pastries category : during this test, the chefs will be evaluated on their skills in making laminated yeast based dough, brioche dough, brioches and milk bread. Artistic buffet category: this category will call on the chefs’ skills in creating artistic decoration in line with the theme of this year’s event: weddings. Snacking category: a final test which will require those chefs taking part to showcase the diversity of savoury products, focusing specifically on innovative, original and healthy sandwiches. Everything that will be made has been chosen by the jury and the participating teams have been made aware of the products prior to the competition. These three renowned Chefs, all of whom teach at Le Cordon Bleu Paris institute, have decided to pool their expertise as they embark on the French Boulangerie Cup adventure. After working in several prestigious establishments, Bakery Chef Instructor Vincent Somoza really made his mark at Le Bristol hotel: following 9 years in the kitchen brigade, he played a role in the hotel’s restaurant being awarded its third Michelin. Boulangerie Chef Instructor, Vincent Somoza, joined Le Cordon Bleu Paris institute team in 2016. Specializing in freshly baked pastries and Italian pastries, Chef Denis became an expert in bread culture whilst in the Mediterranean area, following several years with Pasquale Marigliano. He also developed his expertise in different ancestral bread making techniques, alongside Thierry Delabre. He has been teaching his expert knowledge to the institute’s students since April 2018. Instructor, pastry and boulangerie chef, business owner in the north of France, Chef Hoël gained wide-ranging experience before taking part in the Coupe Louis Lesaffre, world boulangerie chef championship, which has taken place every four years since 2004. He has been teaching at Le Cordon Bleu Paris institute since 2016. In their quest to win the competition, the three Chefs will be coached by Chef Olivier Boudot: after kicking off his career with Eric Kayser, this highly professional chef worked for a number of leading establishments and received numerous awards. He was named Champion of France in 2009 (bread category) during the French Boulangerie Cup and, in 2010, he was crowned Champion at the European Boulangerie Cup as part of the team representing France. Olivier Boudot has been a Boulangerie Chef Instructor at the institute since 2013 and Technical Director - Boulangerie since 2016.